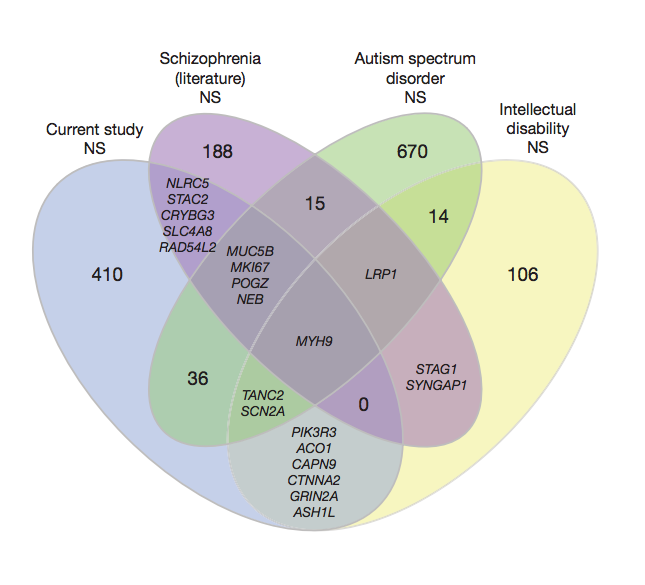 The study below is sensitive to rare variants which are implicated in schizophrenia risk. These rare variants add to the heritability already associated with common variants, estimated to be at least 32%. In related work, mutations affecting schizophrenia risk were shown to depress IQ in individuals who did not present for schizophrenia. These results suggest a model for individual variation in brain function and cognitive ability driven by the number of disruptive mutations ("nicks" affecting key functions such as those listed below). Some of these variants are relatively common in the population (e.g., have frequency of at least a few percent), others are very rare (e.g., 1 in 10,000 in the population). See also Deleterious variants affecting traits that have been under selection are rare and of small effect. 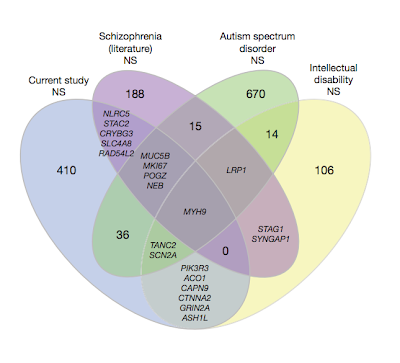 Caption: Overlap of genes bearing nonsynonymous (NS) de novo mutations in schizophrenia (refs 12–14), autism spectrum disorder (refs 6–9) and intellectual disability (refs 10, 11). Overlaps of six or fewer genes are listed by name. See Extended Data Table 5 for statistical significance of these overlaps, and see Table 2 and text for disease sets. Mapping out more genetic correlations will give us better definitions of phenotype. A lot of our definitions of different psychiatric disorders are rather arbitrary, and genetic clustering may help to sort out the major clusterings of traits. "enriched" = enriched for mutations. The frequency of mutation in these gene sets was higher in the schizo group than the normal group. Couldn't you argue that schizophrenia is an intellectual disability? You're misperceiving reality, misprocessing information, and you're cognitively dysfunctional and maladaptive. What exactly is the difference between stupidity and insanity and is it analogous to the difference between intelligence and creativity? The first gene variant found to increase synaptic plasticity improving test scores... You're welcome. The "Disruptive Mutations" would be a pretty good band name. Contrary to the Nature paper linked to above, a CNV study in the January issue of Intelligence found no association between CNV numbers and IQ ("Low-frequency copy-number variants and general cognitive ability: No evidence of association"). Since it took 180 000 people to find a handful variants associated with height and this one only used 6000, I don't think we can say anything with confidence yet. Especially since what we presumably are looking for in these studies are very rare variants. Unlike the Nature paper, they focused on general CNVs. The Stefannson paper restricted themselves to those that affect schizophrenia risk, so it wouldn't be strange if it were easier to find ones that affected other aspects of cognition. "and so what?" asked mr kotter. "oo! oo!" horshack said. "mr kotter. mr kotter...so nothing...totally meaningless." and so as Communism had its homo sovieticus, the pseudoscience of behavioral genetics has its homo geneticus.